What’s the difference between bailiffs and debt collectors? A debt collector doesn’t have any special legal powers, while a bailiff does. Bailiff was the term used by the Normans for what the Saxons had called a reeve: the officer responsible for executing the decisions of a court. The term bailiff is derived from the Old French word baillis. In the early 21st century, the Blair Ministry took exception to the use of certain ancient terms within the legal system. Under part 3 Tribunals, Courts and Enforcement Act 2007, which came into force in April 2014, most bailiffs were therefore renamed Certificated Enforcement Agents, while the County court bailiffs and any other remaining directly employed bailiffs in other courts were renamed Exempted Enforcement Officers. In popular speech, the term bailiffs is still commonly used. They have a legal right to visit the debtor’s property. They have a legal right to remove and sell the debtor’s goods to pay off a debt. They deal chiefly with CCJ:s, council tax arrears, child maintenance arrears, parking penalties issued by the local authority, criminal fines, and similar. Exempted enforcement officers are also utilized to collect money owed to HM Revenue & Customs, such as National Insurance, tax credit overpayments, income tax and VAT. Sometimes, tipstaffs (of the high court) will call on exempted enforcement officers to aid them in serving personal papers, e.g. divorce papers. For many consumers, is it especially important to adhere to the payment plan for debts that can be collected by EEO:s or CEA:s since missed payments can lead to the loss of goods. In a way, these debts are similar to secured debts such as a mortgage since you can lose your possessions if you fail to pay. Please note that for other types of debt, the creditor can usually apply for a County Court judgement that will turn them into debts collectable by EEO:s.
Under part 3 of the Tribunals, Courts and Enforcement Act 2007, county court bailiffs, and any remaining directly employed bailiffs in other courts, were renamed exempted enforcement officers. Exempted enforcement officers are directly employed by HM Courts Service. County court bailiffs (since April 2014: exempted enforcement officers) carry out enforcement for county courts. They are, among other things, involved in the recovering of unpaid county court judgements (CCJ:s). Exempted enforcement officers have a legal right to seize and sell the debtor’s goods to recover a debt. Exempted enforcement officers have a legal right to affect and supervise the possession of the property and the return of goods under hire purchase agreements, and serve court documents. Exempted enforcement officers have a legal right to execute arrest warrants and search warrants. Certificated enforcement agents are used by local authorities, Her Majesty’s Courts and Tribunals Service and landlords. Similar to an exempted enforcement officer, the certificated enforcement agent has a legal right to – among other things – collect debt. Just as for exempted enforcement officers, there’s a protocol that must be adhered to. For instance, certificated enforcement agents must give several days notice before visiting the debtor’s property to take control of goods. Debt collectors work on behalf of a creditor or a debt collection agency. They are not bailiffs, certificated enforcement agents or exempted enforcement officers and they don’t have any of the special legal powers of the CEA:s and the EEO:s.
Debt collectors are sometimes referred to as doorstep collectors, since they show up on people’s doorstep and try to convince them to pay their debts. An alternative, but more vague, term is field agent. Today, it is uncommon for high street lenders to utilize debt collectors since it is an expensive way of trying to get someone to repay their debt. It is more efficient for the creditor to apply for a County Court judgement. If the debtor does not adhere to the repayment plan stipulated by the county court, it falls within the powers of the exempted enforcement officer to collect the debt and the creditor doesn’t have to employ their own collector. Still, creditors sometimes mention over the phone or in writing that they intend to send a debt collector to the home of the debtor. In many cases, this is more of an intimidation technique than a plan that they actually intend to follow through. Debt collectors have no special legal rights. They can not force you to make a payment arrangement, only ask you to. Sometimes they will ask for a cash payment upfront, but you have no legal duty to provide them with this. You do of course have a duty to repay your debts, but you don’t have to do that on your doorstep, to a debt collector. You can always contact the creditor or debt collection agency in writing or over the phone and make an arrangement directly with them instead. 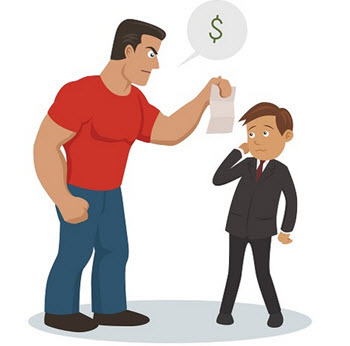 If you do decide to make a cash payment directly to a debt collector, always ask for ID, write down the name of the debt collector and make sure you get a detailed receipt for your payment. Debt collectors do not have any legal rights to take anything from your property without your permission. You don’t have any legal duty to open the door for debt collectors. You don’t have any legal duty to let debt collectors into your home. If you ask a debt collector to leave, they must promptly adhere to your request. If someone claims to be a debt collector, exempted enforcement officer, certificated enforcement agent or similar, always ask for their ID and write down their name. When can a “bailiff” collect a debt? In most cases, a certificated enforcement agent or exempt enforcement officer (both collectively known as bailiffs in everyday speech) can only be sent to your property to collect a debt after a court order has been issued. This court order can come from County Court, High Court or Magistrate’s Court. A notable exception is debts that fall under the auspices of HM Revenue & Customs. HM Revenue & Customs can use exempt enforcement officers to collect debt without first obtaining a court order. It is however unusual for them to do so unless you ignore correspondence from them. Can they show up without warning? No, bailiffs must first send you a letter notifying you of their intent to visit you. This letter is called a notice of enforcement and must be received seven clear days before the visit. This gives you time to either pay the debt in full or contact the creditor and try to set up a repayment plan for the debt. Are they allowed to break in or use force? This depends on the debtor and the type of debt. Generally speaking, bailiffs are not allowed to break into your home or push past you to get in. Nor are they allowed to enter if there is no one aged 16 or more at home. There are exceptions to these rules. For instance, bailiffs can be allowed to use force to enter a home when collecting criminal fines. This is only to be used as a last resort and it is rarely done. Force may also be used when collecting certain tax debts for HM Revenue & Customs, after obtaining permission from the court. Also, if a bailiff has already been into your home and made a list of goods to sell, they can use force to enter on their next visit when they come to collect the goods. These are just a few examples of situations where force may be used. It is also important to keep in mind that bailiffs collecting debts at business premises have wider powers to use force than when collecting debts at homes. Are they allowed to force me to sell stocks at a loss? They are not allowed to force you to sell stocks unless they have a court order. If they do have a court order then you can be forced to sell your stock at the market price even if that is at a loss. They stock has a given market value and what you bought them for is not relevant in this case. They are not allowed to confiscate binary options or other financial instruments that lack a market value until they mature. Yes, bailiffs can seize Bitcoin if they are aware of their existence and you are required to reveal the password to your wallet. You have a responsibility to reveal your Bitcoins if the bailiff asks you about your assets but they have no way to verify whether you have Bitcoin or not if you have it in cold storage. Bitcoin trading is very high risk and we strongly discourage you from trading or own bitcoin if you can not afford to lose the money invested. Bitcoin might be a bubble. Will they take my stuff right away? 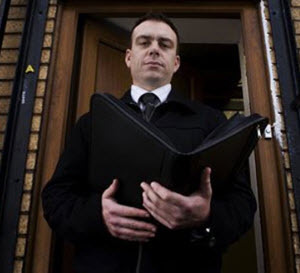 Bailiffs have the legal right to take goods from your premises right away when they visit, but they usually don’t. Instead, they make a list of objects in your home that could be sold to repay your debt and then give you another chance to come to a repayment agreement with the creditor. If you fail to reach an agreement or fail to adhere to the agreement, the bailiff will return to take the listed goods.